Editor's Note: the following is not a "review," but part of Theasy's ongoing efforts to find more productive ways to cover the wide variety of theatrical performance in NYC. Enjoy! BOTTOM LINE: Sure to be a good time with the incomparable Kippy Winston. In advance of the premiere of the series Real Talk / Kip Talk, Theasy sat down with Ms. Winston to talk with her about her upcoming work. Follow our Twitter feed on Saturday, December 3 for our review, live-tweeted from the event. It’s an honor to speak with you, Ms. Winston. Thanks for making time for Theasy. Kippy Winston: It is a grand plaisir for moi! The honour is all mine. I’m so looking forward to the first, and hopefully many more, evenings of Real Talk / Kip Talk. I think we’ll be witnessing something truly magical. What should we be expecting, Ms. Winston? Many people know me from around town on the Internet, but this is my first public appearance, if you will. I am actually quite shy you see! So that's a fun element of this first episode. Then we have a truly epic cast of special guests. I wanted to interview two movers and shakers who have ties to the fashion industry and so the obvious choices were Claire Mazur (Of a Kind co-founder) and Marguerite Wade, a production designer and founder of Full Court. Then there will be a screening of a film that features an interview with Niegel Smith (The Flea). That segment is helmed by my executive producer Eliza Bent and is called Artistic Directors on Divans Dunking Donuts. Rounding out the evening is a panel of real talk ranging from gender and race in casting to our current political climate featuring the likes of Sarah Benson (Soho Rep), Cusi Cram (A Lifetime Burning, The Big C) and Leah Nanako Winkler (Kentucky). I can hardly believe the talent we will have on stage! Where did the idea come from to host this series? You know the "10 Block Rule"? The notion that one should hold one's tongue until one is a safe distance from a theatre? I am fascinated by this rule—and follow it assiduously. But I wonder if there's a way to put the very honest post-show conversations that happen in bars and in hushed tones on subway platforms in a public setting. One that is celebratory, not just snarky. One that is rigorous and de rigueur. I find myself reading the reviews and yawning. The singular voice of a critic is fine—especially if the critic in question has a shimmering voice like my friend Hilton Als or say, you! But is there a way we can explode arts coverage to include a multiplicity of voices that are as complex and thorny as our starry arts landscape? This is the central question in Real Talk / Kip Talk. It may be a big failure. But you know the old saying: Fail big or tornare a casa! Mon ami are you unfamiliar with The Radish?! It is my semi-annual—and semi-autumnal—gossip rag, a mash up of The Onion and US Weekly. 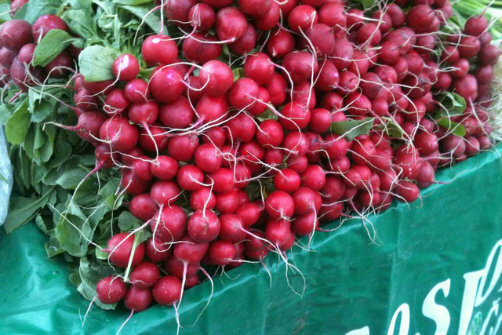 The Radish gets to the "root" of downtown theatre gossip! Also, radishes are an under-sung root vegetable. They make a fine addition to a sandwich if one happens to find one's self in Poland. Tasty on a taco too. And they are a really beautiful colour. Kippy is trending worldwide. You’ve been an international spy, hob knobbed with world powerhouses, and now run a boutique PR firm. With attention from Vogue, Al Jazeera, and an esteemed Milan newspaper, we’re so glad that you could take time out of your busy schedule to host this series here in New York. Since, as you say, you’re “where journalism meets hedonism,” what do you do to unwind, Ms. Winston? I always make time for the "little guys" and Theatre Is Easy is one of my faves! To unwind I head to the sauna. Or the hammam if I am in the East. What’s been the most profound piece of performance you’ve had the opportunity to witness? My mother puts on the greatest show every night at the dinner table. You even have an advice column to your name. Tell me, Kippy, what advice do you have for me, a member of the press? It would be a tremendous honor. Keep on writing! Don't let the editors get you down! May your writing be as multi-faceted as the thoughts in your brain! I am genuinely worried about arts journalism. Some of the old rags are now merely pamphlets full of ads. It's so dispiriting. And despite artists always complaining about reviews, arts writing is so, so important not only to artists but also to arts lovers. For posterity. I am Theatre UNeasy about the direction we seem to be going in which is yet another reason why I admire the work you and Theatre Is Easy does. Well, thanks so much for your time. Looking forward to witnessing history this coming Saturday. Real Talk / Kip Talk is conceived and performed by Kippy Winston. Directed by Modesto Flako. Set and Lighting Design is by Christopher Bowser. Sound Design and Stage Management is by Skylar Fox. Associate Producer is Caroline Gart.